Anyone Familiar with Archangel Azrael? A while back, I noticed Archangel Azrael (the angel of death) has caught my attention. I was wondering if anybody knows anything about him, as info on him is scarce. I'm mostly looking for free and/or internet resources, but any format is welcome! I think I've been drawn to him because of all the transformations I've been going through, so would it be a good idea to call on him? With a transition or transformation it often is a death of a part of whom or what you were going forward into whom one becomes. It can feel like a part of you is dying off but its not a death, its more putting at times roles in the family in their proper place or moving from situations that have no end in sight and distancing your role. At times we go spriitually and those around us do not like it or understand it and they want you in that same blocked place they are in. Demands at times are too great and you seek that all important personal space. Azrael's name means 'Whom God helps'. the other side. Call upon Azrael for support and comfort. and comfort. Patron Angel of the Clergy. Thank you! This is very helpful and makes a lot of sense considering what I've been going through lately. Ive met Azrael myself. we have a mutual friend. he helped me tackle some of my fears a while back. Dont expect him to talk alot, if at all. ive come to know him as someone who lets his actions speak for him. if anything hes the angel I have the most respect for. When I first met him, it was like being visited by death. ( very scary ) But its a clever way to teach you not to be fooled by appearance. and not to judge someone by it. instead, judge someone by their actions. There is a user on here named Holly. Ask her about him! Ohh damnit, it's true sh1t happens, I might have replied for a wrong reason, but would be a waste to delete my reply. Well, not sure Why I Didnt. LOL. Anyway, You will find some parts of my story - about how I felt empowered and helped through Archangel/angel helpers in defeating and resolve my inner conflict of dilemma/Drama. Running from it instead of fighting or talking through my dreams with angelic help. An angel Death. The false fallen One? Maybe. Or that the true one for me. more blabbering! To The Point. I've been in a very similar situation as you. So If You want my advice, Dont fear, what you dont understand. If you cant find information, and lets play with the thought, you become not good with the situations of this Azreal, higher being. Could be a false, confirmation in you. And if you fear Azrael, It kills your spirituality. Instead, do what u want to do. Enjoy the ride. You Reap what You sow. - what you gain as experience in your life's path. We are all in different stages of consciousness. Still clumping or climbing the Jacob's Ladder. Sometime, we need a few steps backdown. So my last and final words: Follow up the breadcrumbs and see the signs In your Path. You the one who is In Control. Nothing else can hurt you, for so long your on the true way meant for you. Unless you need to feel the bad and the good to mold you in the long run(trials). That's what I should have said instead all this text of wall, my apologies. Transformation of oneself is the highest path to take. You are in Control then living in the present, here and now, by keeping yourself on track. 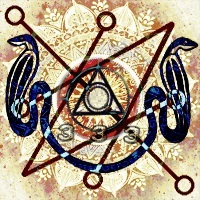 Seal Of Saturn - Azazel/Agiel Seal. One Question?! Azrael may not be Azazel, but for me, Azazel is the Angel of Death(bringer of knowledge, enlightenment to the few, transformations, craftsmen). Between the edges of thoughts, between the line of the good and bad, we people mankind can define. Evolve. Remove my limits & restrictions in life. Time&Death. Transformation Like a Snake Shreds Its Skin. That's the Unseen Forces at work of Azazel's influence on the entities/beings/humans. Sure is a nice symbolic symbol, meaningful event for one in need. But holds a lot of other meanings. Mythicism or whatever, only will help one, if you keep yourself true to you. Without lying to yourself. And be manipulated/by other influences at you in the daily life, as we goes. After all. I am a wannabe of the ancient Wizards/Sorcerers/Shamanic matrix hackers. And by all means ignore this symbol, it doesn't matter, unless the meaning is revealed for one. besides the realms, and sacred geometry that's hidden in the symbol. magical squares. Hint. Kabbalah or The World Tree. It will fit to some degree for some-nvm..
dimensions of creation, worlds/realms/primordial energy. Eh? IChill? Oh not this case. Lets Carry on. Well here's the checklist; FAQ. I am still Alive? Half'awake and Asleep, somehow Yes, I AM still aware of life. Fallen as an Angel? Yes most likely. Reborn? Suddenly, I am, Indeed! Dark Arts? Check nothing is darker than Death. Cursed? Yes still living in this none-stop conscious nightmare called life. In many lifeforms. Future-Present-Past. Wheel of Life. Remove my blockades. Trials to overcome? A'lot. Remember one time. I learned to be immune for nightmare in dreams. Immune to feel the fear of the unknown. while levitating over the dream floor, such a really badass death angel, and the angel throws Dark Energies Balls to melt into my monsters that hijacked their existence in my unconscious mind's roots..
hah Meh nvm that, it were Just my dreams in the past, I had my own fellowship of IChill - My spiritual alliances with beings of the lower realms. Eating lower realm beings. I am evil in order to escape my own fears. So I devour them all, even my own fear. Embrace and Accept even the Dark, this is where the light transforms. Else I Haven't seen this good guy angelic sir. "The Angel Of Death" since that time in its battle-form while I was chasing dreams/astral projections events in order of changing into something greater. Azazel A great deal of self-perfection in my life's path huehue, where I killed My Self.. or the most of my Ego would allow to vanish -since The Ego its purpose gave no meaning to hold on too anymore. Time for me to begin some crafting a new mindset of self. Reality - awareness, Expand, Death, Time, Reborn, Transmute To Transformation of the final test. ?! shh. Well I didnt know myself at some point, after I thought I did what IChill now plays with, Fire. The´Death Of me(Ego)! (by some triggered fated events all mixed in a short period of time).. sweet jesus. And time to be reborn. Remove my restrictions. Empowering oneself. Change. Wizardry. You Reap What You Sow! Remove ones Limitations.. But I would lie if Azazel Saved me. Only A part of it, specially Inside my Universe. Power of shifting the polar poles. Since I walk Within my own universe (inside oneself). Yes the weather is quiet dark & Sinister. Today, as usually in the Lower Realms. Ghetto like, faded visions of blueish darkest light. - all hail Azazel ruler of all. Ruler of Death. More like Hades region IN hell. Nothing in my world or existence is trully EVIL. I AM WHAT's EVIL. I need to shift the dark rooms inside of me. Lit my fire a candle of light. In my perfection of self. My rooms are now full of light. Step careful ahead. Life is full of dangers,(but when we load our consciousness other places, oh sweet dangers) as well in the most sinister and cold corners of existence. A lot of fakers(entities), They are not who they claim to be. Wannabe thought-forms with own agendas. Just like every other inner warfare going on in living beings... Same conflicts, in order to sacrifice something to gain a new thing/heights in order to be able to obtain it - thats just like every human too, south meets north, conflict, all living beings of intellect have in life. I am A Godlike being with no limits there (innerself) and yet besides my human mindset there are actually heavy restrictions- on my powers of action. Discipline... Discipline... I am lacking from Birth, in my brain/body setup with all my WILD dreams in meditations - astral projection. Azazel, grant me this. I Command it. Take my ego,feelings, my limitation, I dont care. I sacrifice. Transmute +/- in value for something anew. In oneself. OK . enough. And yet I smiled. I take them with me. Transmute themselves with my help, an alliance. Can you still turn the light switch, if you have a false awakening up? If yes, go forward, if not where everything is dark. "Open /closes my eyes" wake up... "doesnt work" ... oh hello there, spidey in my corner. Nice legs. But where's the spin?? Oh, a stare context, just like the hatman, who speaks hellish voices with glowing red eyes, barely showing any form details, than darkness, so far away and yet so close to me. In their spider's web. Big Spiders are bad spiders. Eat them let them perish with Azazels powers of Death. Astral Spiders and foreign entities from weird places - they tap into a connection through us, we live in a big network of strings..
invisible threads of all creation..allConnected - and we cant disconnect it. Only blind ourselves, Ignorance is bliss. Lol I went so much off-topic, but.. so now you know, enter my mind! No one is safe. Unless we learn how to strengthening our scales. Until the ultimate test In Oneself ----through----> life's path = transformation(trial). Life is weird, as thoughts shapes with sound'frequencies into our reality in thoughtforms, we barely can perceive thro dimensions. oh now i will stop my deal..
Not here to share bad vibes with bad intentions. almost trollish that's not my intension. Only to spread a piece of my weird mind. Into the abyss I go. So yeah that's a little bit/ part of my perspective ABout Azazel, Angel Of Death, Sigil Saturn. Blabbering. Some Inspiration, since I enjoyed drill through my mind of ideas. I used. Empowering. Anchors. Tolerance. --- But I cant empower others, And this wont empower people it will be false knowledge to you.. Make up your own stuff. I cant lie to you. Sorry for invading your thread, if I didnt enlighten about Azrael and went instead for Azazel, A bad guy I guess? For some An angel for others A demonic fallen one. huh! huehuehue nvm that. This was just a part of my life, an experience, most in the past. But As you undergo this period of life, atm. I guess, I saw some part of me past-self. Figuring all this out. Again This is me. ICHill's spirit of deception to embracing the Uplifted Stages of Evolution in one self. Point it out again, If You need it, seize & create it, if we,me,you needs it. You need to feed it. And it's done, when it's done.Enough said silly Ichiilll oh. true. nvm..
soo yeah. Lol I guess I will take my leave now. This is how I was influenced by angelic archangels or what people want to be empowered by of heavenly influences. Higher beings. Today I found another way, but still. I thought This was coolish thought-print, we could empower ourself with, and allow it to manifest in us. Energy is energy after all by thoughts and investment in it. In my case after all. Yeah haha fading away now folks. I will be between the echos of my own shadows and thoughts(shhhh..) Inside my Castle. But it sure looks Great now, after cleaning out the bad spots in my view. This is nothing about being evil, but more like something occult in oneself, to win over. I did what I thought was a good way to deal with it. And no regrets - it shines more bright than ever now. Higher realm alike. - One Love, Peace & keep up the Good Vibes in life! Last edited by IChill : 03-02-2018 at 05:37 AM. I pray to Azreal to help connect me with my partner who passed seven months ago. I ask him to guide my partner in connecting with me and also to give me comfort in my grief. When I pray to him, my prayers are usually answered very quickly (if it is something like give me some comfort in my grief). I usually feel more hope for the future. Azazel is known as the king of demons, while Azrael is known as the angel of death.